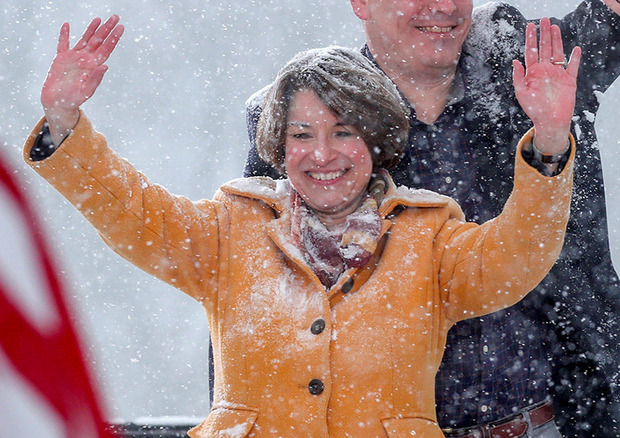 No-one would plan a presidential kick-off in a snowstorm, but in the case of Democrat Senator Amy Klobuchar, who will run as a politician with “grit” as she described herself from the heartland of America, the grace with which she and other Minnesota politicians handled the state’s infamous winter conditions could not have been more helpful to her presidential chances. The contrast with a deceitful president, a man who inherited wealth and avoids physical challenges (whether it was the war in Vietnam or a rainy day at a WWI cemetery), could not have been more stark. Klobuchar stood without a tent, an umbrella – or even a hat. Klobuchar enters a crowded field. However, she showed the kind of tenacity and you-see-what-you-get quality an underdog candidate needs to win over Iowa residents one living room at a time and win New Hampshire voters one Granite State town hall at a time. If nothing else, she proved Sunday not to underestimate her toughness.